I'm am unapologetic, unabashed fan of the TV show House. 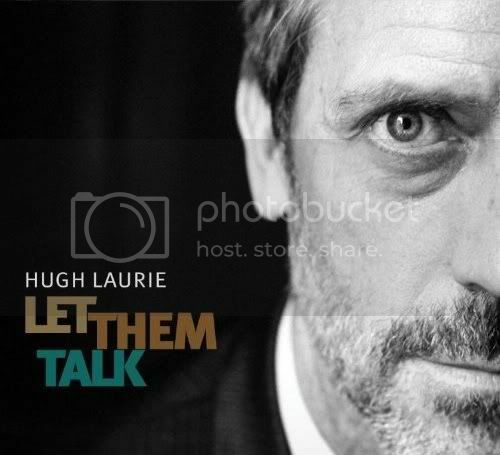 I'm not a huge fan of actors dabbling in song nor songsters dabbling in acting but this week Hugh Laurie unveils his blues album Let Them Talk. Those familiar with Laurie's career and bio know he's been playing piano for ages and is quite accomplished. He's participated in a project called The Band From TV with fellow actors who do a series of shows each year raising money for their favorite charities. It's a noble way to use one's celebrity and have a little fun with one's hobby. I'm not knocking it. I've read the liner notes Laurie wrote for the CD and he's well aware there are plenty who will have their knives out for a celebrity British white guy playing the blues, and he doesn't particularly care in the most charming of ways. I'm not making plans to buy this one but it seems he enjoyed doing it, so I wish him the best with it. George Strait is one of these ageless wonder sorts. I didn't bother looking up his age on Wikipedia because I'm pretty sure whatever they say he is, they're wrong. I'm not calling the guy old- it's just that he seems to have always been here and he's got another record out this week. Here For A Good Time is his 250th official release (number approximated by my crack staff of abacus specialists who may or may not be off by a record or two). He's not stopping so you might as well break down and embrace it, country fans. George Straight is here to stay. The great Lindsey Buckingham has a new record out this week called Seeds We Sew. I've enjoyed portions of his previous two solo releases and rather imagine there's a song or two on this one I'll like. I'm not sure how soon I'll get around to finding out what they are being stacked up with reviews I've yet to write but Buckingham is a consummate pro and a songwriter who gets recognition but seems to still be under appreciated. Our resident electronica expert Sterfish already reviewed The Chemical Brothers' work on the Hanna soundtrack and yet this title once again shows up on the New Release list. It's being re-issued with one bonus track a remix to coincide with the film's DVD release. You can check out Sterfish's review and decide whether to check this out if you missed it the first time. Last but certainly not least: Amazon is advertising this as the week a physical edition of Gary Clark Jr's Bright Lights EP is made available (it's already out digitally). Jordan Richardson raved about it and now most of us at BlindedBySound are firmly on the Gary Clark Jr. bandwagon. I continue to scour the internet for physical copies of his previous work and have come up empty. If any dear reader can put me in possession of the actualGary Clark Jr. EP or Worry No More on CD, you will earn my undying appreciation. That's our say; what are you looking at this week?